As well as lifelike tooth shades, the GC GRADIA® PLUS system approach offers a solution for the most complex “red” aesthetic cases. 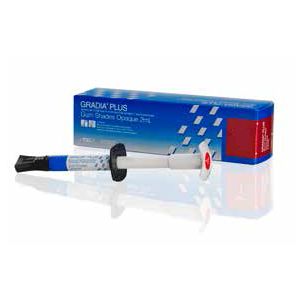 The GC GRADIA® PLUS system offers key gum shades that reproduce gingival tissue for indications such as implant superstructures and other fixed or removable prostheses like crowns, bridges and partial dentures. The wide variety of red shades allows you to closely match a patient’s gingival tissue in color and texture, regardless of their age or ethnicity. They are available in both Light Body and Heavy Body paste types, allowing you to choose the best/preferred consistency depending on the case.